Better Half of Steve & Eydie: Eydie Gormé, a popular nightclub and television singer who had a huge solo hit in 1963 with “Blame It on the Bossa Nova,” died on Saturday. She was 84. Ms. Gormé was a successful band singer and nightclub entertainer when she was invited to join the cast of Steve Allen’s local New York television show in 1953. She sang solos and performed duets and comedy skits with Mr. Lawrence, a young singer who joined the show a year earlier. When the program became NBC’s “Tonight Show” in 1954, the young couple went with it. They married in Las Vegas in 1957. Although usually recognized for her musical partnership with Mr. Lawrence, Ms. Gormé broke through on her own with the Grammy-nominated “Blame It on the Bossa Nova.” The bouncy tune about a dance craze at the time was written by the songwriting team of Barry Mann and Cynthia Weil. Her husband had had an equally huge solo hit in 1962 with “Go Away Little Girl,” written by Gerry Goffin and Carole King [see Loco-Motion]. Ms. Gormé scored another solo hit in 1964, but this time for a Spanish-language recording. Ms. Gormé, who was born in New York City to Sephardic Jewish parents, grew up speaking English and Spanish. Gormé was born as Edith Garmezano in The Bronx, New York in 1928, the daughter of Fortuna and Nessim Garmezano. Her father was a tailor. She is a cousin of singer-songwriter Neil Sedaka. Her parents were Sephardic Jewish immigrants, her father from Sicily and her mother from Turkey. Gormé and Lawrence had two sons, David, a composer, and Michael, who died suddenly from ventricular fibrillation resulting from an undiagnosed heart condition in 1986, at the age of 23. Michael was an assistant editor for a television show at the time of his death and was apparently healthy despite a previous diagnosis of slight arrhythmia. Gormé died on August 10, 2013, six days shy of her 85th birthday, at Sunrise Hospital & Medical Center in Las Vegas following a brief, undisclosed illness. Her husband, Steve Lawrence, was at her bedside, along with their surviving son, David. 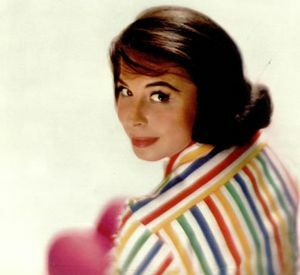 May the memory of Eydie Gormé be for a blessing.